and i didnt try it.But i have installed gdesklets alternative for Docker. 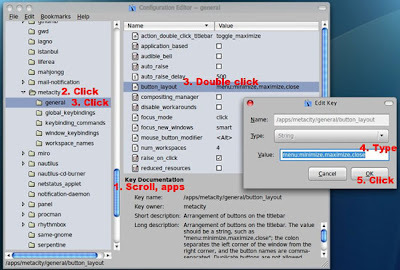 Goto System > Preferences > Theme > Customize > Control. Click Install. 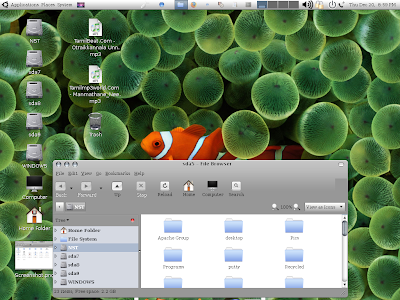 Browse and choose the Mac4Lin GTK Metacity Theme .tar.gz file (wherever it is extracted). Select to Apply. 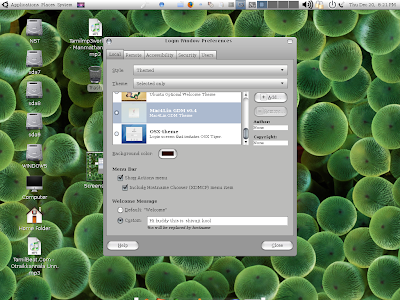 Also make sure that the Window border is set to the Mac4Lin theme. 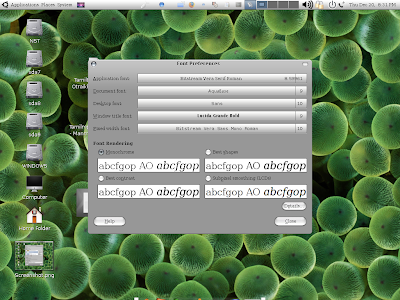 Click on the Window border and select the Mac4Lin GTK theme. 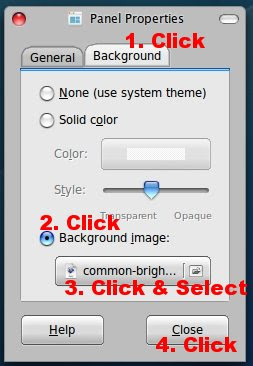 To set Leopard like GNOME panel background right click on an empty area on the top panel and select Properties. Now goto the Background tab and click on the Background image radio button. 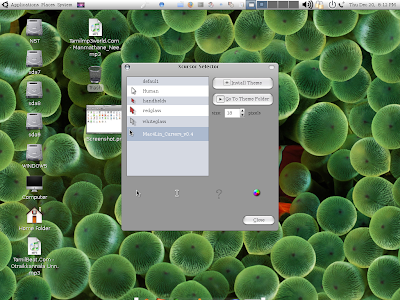 Navigate to /home/<user name>/.themes/<Mac4Lin GTK theme folder>/gtk-2.0/Panel and select the image you like, to be set as background for the GNOME panel. Now we have to shift (close,maximize,minimize,menu) to the left of the title bar.Go to Terminal and type 'gconf-editor' and press Enter. Now navigate to: apps>metacity>general. On the right double click 'button_layout'. Delete that & type: 'close,minimize,maxmize:menu' (without quotes). Press OK and then quit. The buttons will now be on the left side of titlebar. To restore the original layout, just replace the string by 'menu:minimize,maximize,close'. 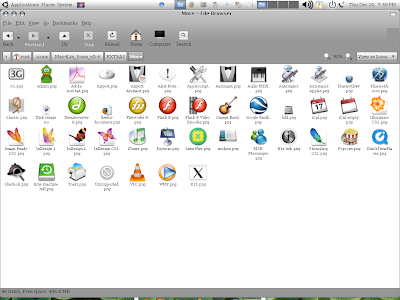 Goto System > Preferences > Theme > Customize > Icons. Click Install. 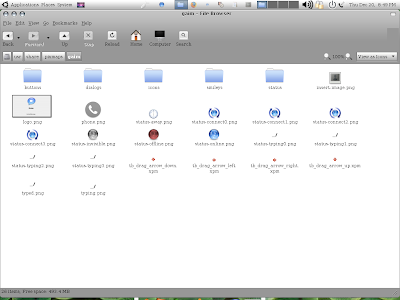 Choose the Mac4Lin GTK Icon Theme .tar.gz file (wherever its extracted). Select to Apply. Now move your menu to the top and try to add the possible applets from this panel. Before installing the cursors first install the package gcursor through synaptic package manager or apt-get install gcursor in the terminal. Goto System > Administration > Login Window > Local Tab. Enter the Admin password when asked. Now add the included GDM themes by clicking Add and seleting the bundled themes. After adding, a preview of the theme will be shown (Leopard). To apply, click on the radio button next to preview. This will bring up the player in the right mode to let you install new skins. Right click on the title bar area and choose Select Skin \ Open Skin, and choose the skin file that you have downloaded. Optionally, you can also click on the first box in the right frame on my blog (http://phoenix-ani.blogspot.com). You do not need to Sourceforge.net login id. All you need is a valid email id. Each vote is associated with an email id, which needs confirmation that you actually voted (you will get an email giving a confirmation link, so all you need to do is click it). The whole voting process takes just 3 clicks. I urge patrons to vote for Mac4Lin if they feel it should win. 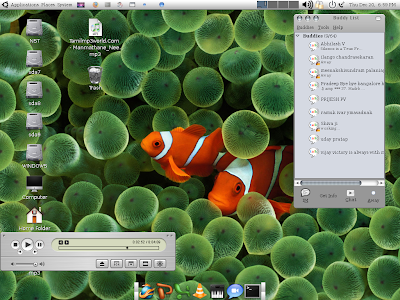 Mac4Lin is completing with projects like Xbox Media Center (XBMC) etc. I once again thank everyone for their continued support, feedback and appreciation. Mac4Lin exists today because of you all :) Do spread the word around about this.